Anritsu Corporation launches its 2×2 MIMO Measurement Software MX886200A-010 to extend the measurement functions of the company’s Wireless Connectivity Test Set MT8862A with support for evaluating 2×2 MIMO WLAN equipment. The MT8862A is the world’s first measuring instrument covers all measurements of output signal quality, transmit power, receiver sensitivity, 2×2 MIMO, etc., of IEEE802.11ac WLAN equipment under actual operation conditions using its built-in network mode. 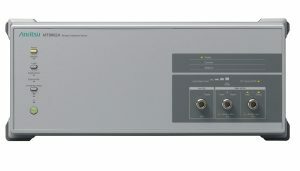 Installing the MX886200A-010 option in the MT8862A supports receiver sensitivity and transmit power measurements of 2×2 MIMO WLAN equipment using two MT8862A units in combination, helping WLAN equipment end users to assure communications quality and troubleshoot the cause of communications errors. Most devices requiring high data transmission rates, such as smartphones, tablets, PCs, etc., are now using MIMO technology to increase the data transmission speed. Adding this 2×2 MIMO measurement function to Anritsu’s popular MT8862A will help improve the quality of WLAN equipment. The spread of IoT is driving rapid adoption of WLAN technologies by home appliances such as printers and televisions, in-vehicle equipment, industrial machinery, sensors, etc. In particular, devices requiring high data transmission rates, such as smartphones and AV-related equipment, which must transfer large data volumes in short time periods, are using MIMO as one technology for increasing data rates. To meet this need by offering a solution for evaluating communications quality of 2×2 MIMO WLAN equipment under actual operating conditions, Anritsu has developed this 2×2 MIMO Measurement Solution MX886200A-010 option for its Wireless Connectivity Test Set MT8862A. The 2×2 MIMO Measurement Software MX886200A-010 is an option for the MT8862A. Installing the firmware and option license from the web browser to MT8862A supports evaluation of 2×2 MIMO WLAN equipment using two combined MT8862A units.